The world premiere of this award-winning new play about the Israeli-Palestinian Conflict is riveting and thought provoking, a must see. The Israeli-Palestinian Conflict is a sticky subject. Be it religious, political, altruistic or personal, everyone has a knee-jerk reaction at the mention of it. There are Muslims that are Zionists and Jews that are not. The complex history and politics have pitted Arab against Arab and Jew against Jew. Misha Shulman’s courageous and sensitively provocative new drama Martyrs Street takes the bull by the horns and steers straight into the labyrinth of diverse viewpoints. The cross section of a month in the life of two households (one Arabic, one Jewish) shown side-by-side becomes a microcosm of the conflict with all its trappings, as well as its deep dark secrets. Martyrs Street is in Hebron, the largest city in the West Bank and the second largest in the Palestinian territories. The impressive set by Stephen Dobay and Caleb Levengood displays two houses whose existence is unauthorized by the Israeli government, both to be demolished. One appears contemporary and secular. The other, simple stone, has a menorah and a Talit (prayer shawl). Behind, between and in front of the houses are paths. Director Ian Morgan, Associate Artistic Director of The New Group, uses the space well. Life doesn’t start or stop in either house. During any given scene, action is still taking place in the other house or in the street. Some appropriate incidental music by Yonatan Gutfeld adds an eastern flavor. The play starts when Nimer (Haythem Noor), an Arab bomb maker, has a meeting with Tsadok (Jonathan Raviv), a Jewish activist who has Moroccan roots. They feel disdain, yet they talk and try to understand each other. “We’re both fighting the same thing,” Tsadok says. Nimer is bewildered over Tsadok’s dichotomy. They don’t trust each other, but they strike a deal. Included in the harsh dialogue is hesitation and inquiry. 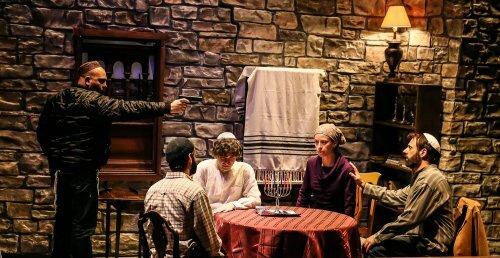 Morgan’s subtle direction clarifies that this play asks, “Who is the enemy?” Morgan’s vision of each character is clear, maintaining a tension not only between Muslims and Jews, but between family, friends and party affiliations. The action is often turbulent and alarming, at times tender and disarming. Morgan is careful to keep the play from becoming melodramatic. There is some awkward blocking, however. In a scene where Nimer fights with his mother Noor (Maria Silverman) over his sister Aisha (Dahlia Azama), the staging is not credible. The struggle lacks the intensity to equal what is at stake. As a result, the dramatic ending of this scene loses the impact the text demands. Shulman is a skilled story teller, creating characters that are real and complex: honorable people that make mistakes, some misguided, some well-intentioned or ruthless. People we all know, maybe even in our own families. 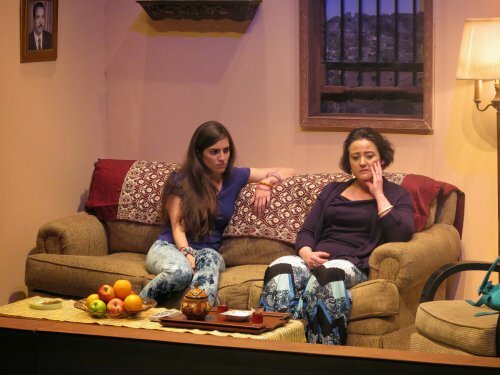 Shulman makes the head of each household, two women, the focal point of the play. Noor, which means light in Arabic, is a widowed professor at the university with a 16-year-old daughter, Aisha, and a son, Nimer. She doesn’t wear a headscarf, and spends time alone with her late husband’s friend Salim (Alok Tewari), which is frowned upon in the community. Noor received an order from the Israeli government that her house is going to be taken down in 30 days. Dvorah (Hebrew for Deborah, the prophet/warrior) is an unmarried, pregnant and religious 20-something-year-old woman from Brooklyn who has moved to Israel for a sense of purpose. Dvorah lives in an unauthorized Jewish settlement not far from Noor. They each fight in their own way to save their homes. The women stop and greet each other on a few occasions. They are uncomfortable and frustrating conversations. Still, they both make an effort to see and listen to each other. A mutual respect is evident. The intelligent writing shows the hatred and mistrust from the confusion caused by propaganda, rumor and/or politics. It also shows compassion and understanding that a human being might have for another if only you stop and say hello. Martyrs Street is powerful in its meaning and its human interaction. As an ensemble, the actors do an outstanding job. Silverman is present and compelling as Noor. She carries herself with a quiet dignity allowing her character to show pride and humility at the same time. Raviv is convincing as a charming leader. Full of passion, he persuades the audience, along with his companions, to join his cause. The rest of the cast perform with great fervor; nonetheless, they tend to get stuck in a one-word definition of their character. The world premiere of Martyrs Street about the Israeli-Palestinian Conflict bravely bares it all, for good or for bad, and delicately places it on the table for discussion. It has already won the Canadian Jewish Playwriting Competition and the Across the Generations International Playwriting Contest. It should be required viewing for all. Running time: 110 minutes including an intermission. It’s amazing just how much mid-twentieth century European history four desperate characters can embody. Exciting musical version of the cult Rick Riordan novel effectively alternates between heavy metal and pop songs, just right for its target audience. The harsh lives of two Afghan boys sold into prostitution to older men are depicted in this disjointed show which attempt to put difficult material on the musical stage. Noel Coward's last musical based on Terence Rattigan's Edwardian comedy, "The Prince and the Showgirl," gets a lavish concert staging by Musicals Tonight!. Maybe we’re ready for a musical comedy about the current state of our country, but this isn’t the one we deserve.